Prior to the beginning of 2019, I had never kept consistent records of my poker wins and losses. In the past, some players were amazed at how I could play poker and not keep close track. Well ... in truth, I just didn't care a whole lot, being a recreational player. I did keep track of my wins and losses on some of my Las Vegas and other trips, but I never kept a comprehensive accounting of my poker play. However, as I have been able to play significantly more poker over the past 18+ months, I figured that it was about time for me find out the truth. Am I a losing player? Am I a winning player? Am I the new version of the old poker blogger Waffles -- the ultimate break even player? I consulted with poker buddy Pete P Peters, who recommended a poker app to me. Thus, beginning on January 1, 2019, I have kept careful track of my in-person poker play, which so far has consisted of $1/2 NL and $1/3 NL Texas Hold 'em games. 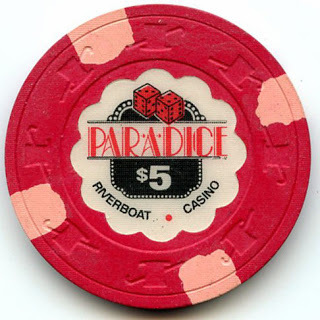 1) I am 4 for 4 in cashing in sessions in my closest poker room, the Par-A-Dice Casino in East Peoria, IL. The games at Par-A-Dice are kind of like a public home game, with the tables largely populated by regulars. This, of course, helps when you are familiar with the players and how they play. I am running a tidy profit at the boat and certainly hope that ir continues. 2) I am 0 for 2 in cashing in sessions at Central Illinois Charitable Games. I ran a little bit better in 2018, but have gotten slaughtered there so far in 2019. I've gotten pocket Aces cracked and lost set over set, lost several hands when I had the second best hand, and probably played a little reckless due to some frustrations. I have not gone back for almost six weeks since I was not having success. Cash games are available approximately two Saturdays each month. 3) I came back from Las Vegas with the slimmest of profits over a great number of hours of play. My biggest profits were at Trooper Thursday at Westgate and at Harrah's. My biggest losses were at Mirage and Bally's. So ... I will end the first two months of poker in 2019 with an acceptable profit. I will continue to add in subsequent poker sessions throughout the year. I did not particularly like the poker app I was using, and was surprised to see that after entering a certain number of cash sessions and tournament sessions (when I ran out of free cash sessions I added additional ones as tournament sessions), I would be required to pay a fee to add additional cash sessions and another fee to add additional tournament sessions. Since I didn't particularly like the app - no thank you. Instead, I will do as poker friend Luke Johnston suggested and just put my totals on a spreadsheet. I might not have the fancy per hour info and the like, but at least I'll know where I stand in the calendar year. Are there others like me -- players who have chosen to live in blissful ignorance of what the true numbers are? If you have an android phone, I recommend Poker Manager by Chronos Inc. I bought it a couple years ago for $6 and haven't had to pay anything additional. I'm mainly a cash game player, so I can't speak to it's tournament features. I do it the nitty old man way -- I have a small monthly calendar booklet and I record wins/losses (cashes/entry fees) by hand. Not very fancy, but it works. Excel spreadsheet works fine also. I actually put my 2018 results on an Excel spreadsheet yesterday. I think that will be fine. About the only feature I would really give up is the per hour win rate. Not really interested in a strict accounting of the number of hours I am playing. I had an app once, but it crashed and lost my data. Then I had a spreadsheet and the computer crashed and I lost that. Now, I have a new Excel spreadsheet, but I am always conscious of the general total, so if I lose it again, I can just start over with the total as a starting point. I do find it kinda crazy that you never tracked before, solely because as a poker blogger, you played enough that I would think you would be curious, but I also understand why you would not track as a recreational player. In any event, I'm looking forward to your future results.